Screens: Over 100 individual monitors and 4 large projections screens. 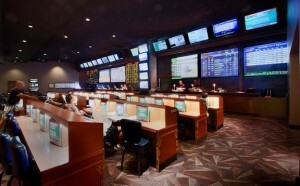 The Luxor is one of only a handful of Las Vegas sports books that are non-smoking. That alone will lure some sports book fans that are staying at the south end of the strip to the Egyptian themed hotel to watch and bet on sports. The screens on the individual monitors aren’t the best, however the larger overhead screens are more than acceptable for sports viewing or catching a horse race or two. The Play Bar is directly adjacent to the sports book and drinks are comped if you are placing sports or horse racing bets. Food options are limited; however there is a food court on the second level above the casino with your typical fast food offerings. Backstage Deli, located near the Criss Angel Theater, has some decent deli style food that you can take back to the sports book. If you’re looking for a larger sports book nearby, The Mandalay Bay sports book can be accessed via a sky bridge that takes you through the Mandalay Place shopping and restaurant area.